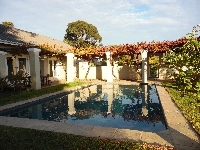 Welcome to our selection of holiday homes to rent in South Africa. The Republic Of South Africa is a state at the southern tip of the African continent. To the north it has borders with Namibia, Botswana, Zimbabwe, Mozambique and Swaziland. To the south is around 1,800 miles of coastline with the Atlantic Ocean to the left and the Indian Ocean to the right. The climate is noticeably cooler than most of Africa due to the land being sandwiched between two oceans and being some distance removed from the equator. Like most African countries, South Africa is perfect for wildlife enthusiasts. Lions, hippos, white rhinos, giraffes, wildebeest and hyenas are just some of the wildlife the land has to offer. Touring can be undertaken via horseback, jeep, hot air balloon or, in certain cases, even on foot. The world famous Kruger National Park and Mala Mala reserve are dedicated to providing both conservation of species and exploration for tourists. As if this wasn't enough, the coastal regions are also rich with wildlife such as whales and sharks. This makes for an exciting range of adventurous activities such as shark cage diving and scuba diving. Then, of course, there are further activities unrelated to wildlife such as sea kayaking, surfing, water skiing or paragliding. Looking for self catering holiday accommodation in South Africa? then below is a selection of villas in South Africa and apartments in South Africa that can be rented direct from their owners. You can either click on each listing for further details or you can use our search engine on the left if you are looking for something in particular.